Didn’t notice but apparently OUE is spinning off their 2 Orchard Hotel as a REIT. You can read the prospectus here. Like most hospitality REIT, it ends up as a stapled security. But you will notice the attractiveness. Hospitality REITs work a bit differently from most REITs in that a sizable part of their income depends on revenue earned from the business and as such they are a proxy to the domestic tourism economy. 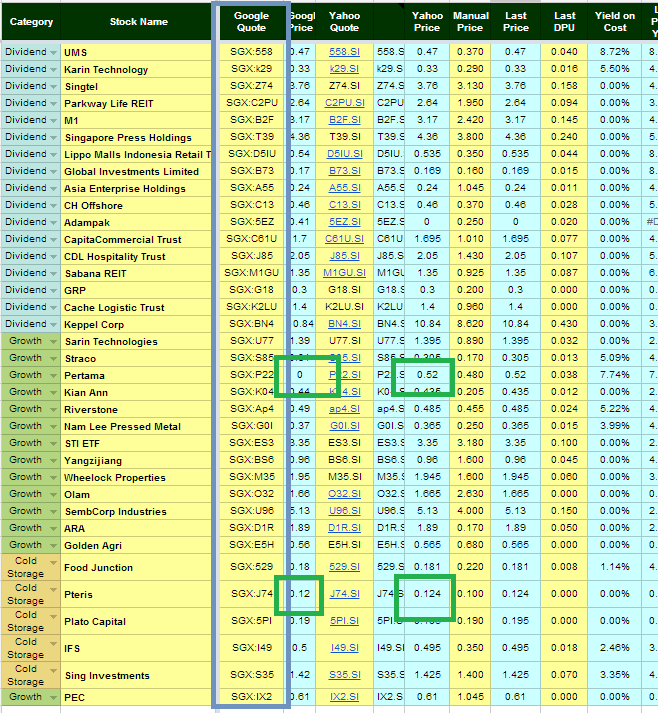 Even then, they look attractive versus Far East and CDL Hospitality REIT, 2 Hotel REITs listed in Singapore. Those 2 REIT will likely offer only 6% yield at current market price. It is strange how come SPH, Mapletree this year decide to list this properties as a REIT with so little assets. All three will list with only 2 assets. I did not managed to look past all but there could be an explanation for the higher yield. Both Mandarin hotels are leasehold and they run till 2057. That is 44 years of land lease only. Its basically like an industrial REIT with a fluctuating income and at a lower yield. Whether to go for this IPO or not depends on the receptiveness of the investment public to this kind of segment. It used to be very popular but given the recent drawdown its hard to say. Long Term wise This doesn’t appeal as a long term hold. Would rather go for Aims Amp here! By no means is it cheap after under going the recent correction. If I believe my capital is under threat with something that I have not foresee I would likely pare down, so don’t follow blindly. I came out with the following slides to be clear about my thesis. I will keep updating the slides if I find more thoughts on the subject. Would well come inputs from tenants and shoppers alike. 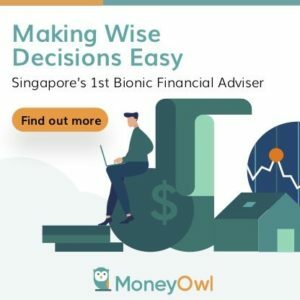 We got to know a few months ago Google Finance supports Singapore SGX Exchange. This means that you can look up say Mencast at Google Finance and you will get a stock price. But it is only recently that the GoogleFinance() Function in the Google API supports SGX as an exchange. 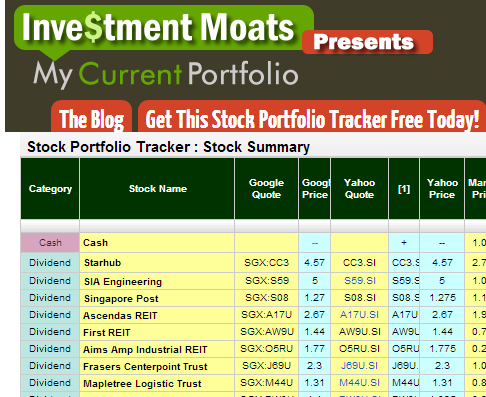 As such, I decide to incorporate it into myAwesome Free Stock Portfolio Tracker. For those interested in Getting Started with this free tracker, view this post here. All you need to do is to put in the right symbol format. Say you want to update UMS. Just look up the right symbol in Google Finance. The upside of Google is really their prices look to be REAL TIME. The downside is that they show last trade price. If your stock is like Pertama, which have not been trading for some time, it will show a zero. Google smallest decimal place is also 2 decimal place, which doesn’t work that well with penny stocks. Starhub Q2 2012 Results–Mobile Payment the next growth area? Starhub announces their Q2 2012 results. Overall, the result are status quo. Current Investors can look forward to another SGD$0.05 quarterly dividend payout. Starhub did not indicate that they will raise their quarterly dividends. This leaves a PE of 20 times and an EV/EBITDA of nearly 10 times. As sound and defensive is this telecom business, 20 times probably means, if earnings doesn’t grow, you would expect to recuperate the money in 20 years. And we have seen in the past three years that the growth rate of Starhub is around 1-3%. Most of the cash flow improvement were due to lower capital expenditures and minor optimizations. There are many misconceptions that smartphone will make them more profitable. On the contrary, the more expensive the smartphones, the telecoms have to subsidize the consumer, which means higher expense in the short run for the telecoms. This price is pretty rich, unless you expect that your dividend grows like 5% per year, which would probably make it a fair investment. Certainly, you are at the mercy of more capital downside then upside. The news this week have been littered with the massive massive collaboration between payment startup Square and Starbucks. Square will enable the consumer cash less payment in all starbucks. In fact, the consumer do not even have to take out his wallet or handphone. The square register Starbucks casher uses is able to detect that the customer has activated payment in the smartphone in his pocket. She can then charge the purchases to his face or name. Square also will process all the credit card payments and earns 2.75% of each transactions. The future of mobile payment, credit card rewards, security is going to change. And Starhub as a telecom is part of this fierce fight between the payment handlers VISA, MASTERCARD, the new payment handlers that rides on them, Paypal, Square and Google Wallet and the telecoms. StarHub’s SmartWallet will allow its mobile customers to enjoy the convenience of using three contactless payment cards on an NFC enabled smartphone – DBS One.Tap, NFC ez-link purse and NFC FEVO Pre-paid MasterCard. SmartWallet will offer users a virtual DBS MasterCard PayPassTM card called One.Tap. With just one tap of the smartphone, customers can pay for goods or services quickly and securely at more than 20,000 DBS and MasterCard PayPass merchant partners in Singapore. Existing DBS cardmembers can apply for One.Tap at any time through DBS Internet or mobile banking. “DBS regards the mobile platform as an important customer touchpoint. The introduction of more highly sophisticated NFC enabled smartphones will make it easier for our customers to adopt this new technology. As Singapore’s leading bank with over four million customers and more than one million downloads for our mobile banking apps, we are proud to add NFC to our comprehensive suite of mobile banking solutions that include online banking, protection, rewards and payments. Through our ongoing innovation, we are well-positioned to drive the adoption of NFC islandwide and are very excited to launch DBS One.Tap, our new NFC virtual credit card, later this month. We believe this initiative will further enhance our customers’ experience and offer them greater convenience,” says Mr Sim S Lim, Country Manager of DBS Singapore. SmartWallet users can also tap their smartphones to make retail payment with NFC ez-link purse wherever EZ-Link card payments are accepted, as well as to make payment at MasterCard merchant locations for NFC FEVO Pre-paid MasterCard issued by EZ-Link. “Singapore ranks first amongst 34 countries in the MasterCard Mobile Payment Readiness Index, an indication that the foundation is firmly in place for mobile payments to take off. With MasterCard PayPass on mobile devices in Singapore, cardholders can look forward to enjoying the benefits of contactless mobile payments,” says Ms Julienne Loh, Vice President and Country Manager, Singapore, MasterCard Worldwide. The SmartWallet app makes browsing, downloading and redeeming virtual coupons a seamless experience for customers. They can redeem coupons to enjoy discounts and deals instantly with just one tap of the smartphone, while making a purchase at DBS and MasterCard partner merchants, such as Comfort Taxi, G2000, Pasta Mania, Watsons Convenience Stores, FOX Apparels, Pumpkin Patch, Toys R Us, PastaMania, Popeye’s Louisana Kitchen, Quiznos, Coldstone Creamery and Shaw Theatres, among others. “Shaw Theatres has been embracing new cinema technologies such as the IMAX Digital Theatre System to offer our patrons better experiences. Our partnership with StarHub to offer NFC services will allow us to improve payment modes on our ticketing platform. We hope this will give our technology savvy customers more options in their transactions with Shaw Theatres," says Mr Mark Shaw, Executive Vice President of Operations, Shaw Theatres. Additional payment functionalities will soon include the use of SmartWallet to apply for, store and manage cards from various payment schemes, including those offered by DBS, EZ-Link, MasterCard and Visa, from the smartphone anytime, anywhere. In addition, a whole host of new lifestyle services will soon enable customers to buy and download electronic tickets to movies and events, earn and redeem loyalty points, top up StarHub Mobile pre-paid cards, and pay for bus and train trips, among others. SmartWallet and its contactless payment and lifestyle services will be commercially launched later this month. To start using SmartWallet, customers with an NFC enabled smartphone will need to convert to a StarHub NFC SIM card and subscribe to the free StarHub NFC value-added service. They can then go to Google Play to download the SmartWallet app. Sony Xperia Sola (carried exclusively by StarHub), Samsung Galaxy S lll and Sony Xperia S are three NFC enabled Android smartphone models approved for secure NFC payment service by various global payment standards authorities. The list of NFC compatible smartphone models will be expanded progressively. For customers’ convenience, StarHub will pre-load the SmartWallet app in approved smartphone models sold at StarHub Shops and authorised dealers. For customers to experience contactless lifestyle services, StarHub will offer a new way to instantly enjoy StarHub Music Store goodies at launch. SmartWallet users will just need to tap their NFC enabled smartphone on StarHub’s Smart Posters displayed at selected StarHub Shops and StarHub’s roadshows to download a mystery music track for free. This would probably mean the Starhub customers need to change to a NFC sim card and they can make payment with their mobile phone like their ez link card. Starhub as part of the consortium could probably earn “a little bit” as part of this. I personally think it is not gonna amount to much.